City University London has been ranked at 53rd in the Times Higher Education’s list of the most international universities in the world. 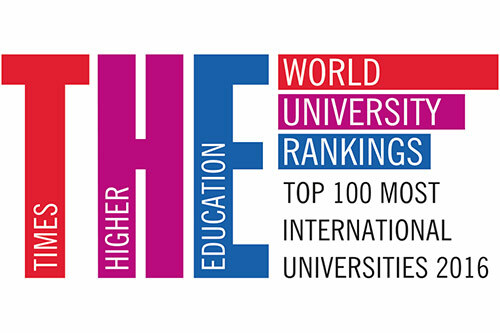 The list is drawn from the top 800 institutions in the Times Higher Education World University Rankings 2015-2016. It is compiled using the ‘international outlook’ indicator which is based on a university’s international student numbers, its percentage of international staff and the proportion of its research papers published with a co-author from at least one other country. City University London has a highly diverse population with students drawn from over 160 countries and territories and staff from over 50 countries. The University has developed an extensive network of partnerships across the globe which support academic research collaborations, staff exchanges and study abroad programmes. This latest ranking is an important recognition of our international outlook and the strength of our global reputation. 2016 will be a very special year for City, as we celebrate the anniversary of our Royal Charter, our joining the University of London and reach key milestones in the redevelopment of our central London estate. "Our outlook is truly global. We welcome students, academics and professional staff from all around the world, work to international levels of research excellence and cultivate a growing network of international education and research partnerships." City’s international reach incorporates the University’s Dubai Centre which was established in 2007 and has emerged as a market leader in postgraduate education for employers and employees in the region. Leading programmes in Maritime Law and Maritime Operations are also delivered by in Piraeus, Greece. City University London is a founding member of the WC2 University Network which brings together top universities located in major world cities to address cultural, environmental and political issues of common interest to world cities and their universities. An institution’s global outlook is one of the key markers of a prestigious university. The top institutions hire faculty from all over the world, attract students from a global market of top talent and collaborate with leading departments wherever they happen to be based. It is great news that City University London is one of the top 53 most international universities in the world. It is a sign of great potential, competitiveness and dynamism.